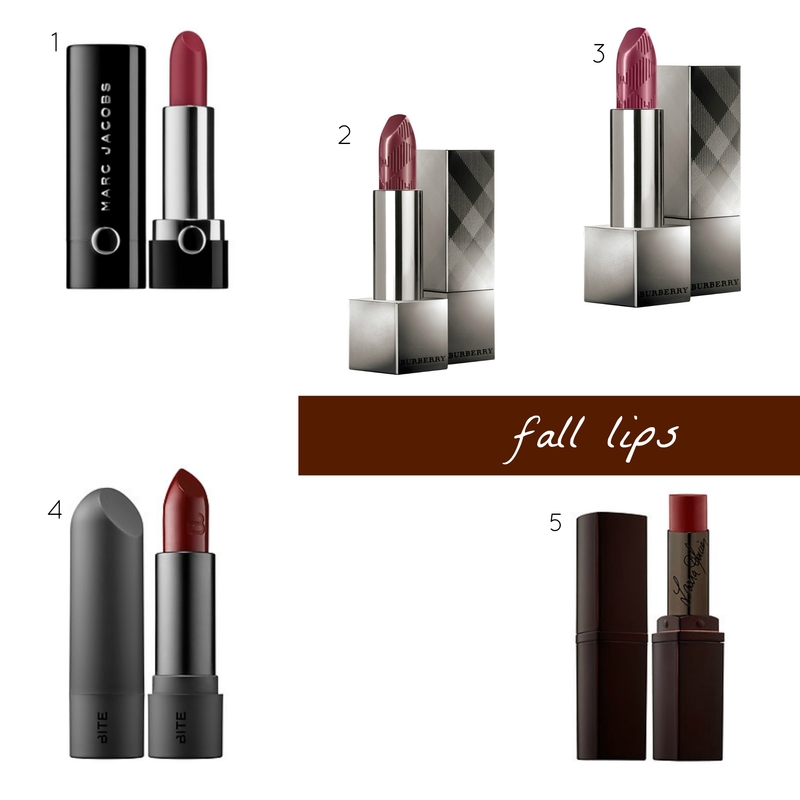 when I think of fall lips, I think of dark berries – plums, cranberries, juniper berries, cherries, etc. the deeper, more intense red shades seem so right for cooler weather. my favorite berry (and one of my holy grail picks) lipstick is burberry‘s oxblood. I’m in the hunt for another one, specifically a deeper, more burgundy cousin to oxblood. despite the name, oxblood is surprisingly beautiful in a lighter-than-expected kind of way. it’s definitely a berry, but it’s softer and not quite as intense as the name might suggest (see it on me here). I’m looking for one that takes the intensity up a notch. laura mercier‘s lip parfait in iced pomegranate might just be the one. I quickly tried it on in store, and I immediately loved the formula – smooth, easy to apply, no tugging. the color is beautiful – it’s a deep, matte, wine. so, so good. the marc jacobs and bite options look sumptuous, too, and I have a good track record with burberry, so I might have to check those out before making the final decision. what’s your fall lip color of choice? Hi! Really nice post you got there! I was actually looking for an entire different kind of blogs and I ran into yours by mistake!! But enjoyed it very much! What a pleasent surprise. Visit my blog https://thebeautyofspace.wordpress.com maybe you’ll have a surprise too and enjoy it as much as I enjoyed yours! Cheers!